The clock is ticking . . . | Eastwood Patchwork Quilters Inc.
Time is passing quickly, the exhibition draws nearer. Here’s some information to jog your memory. 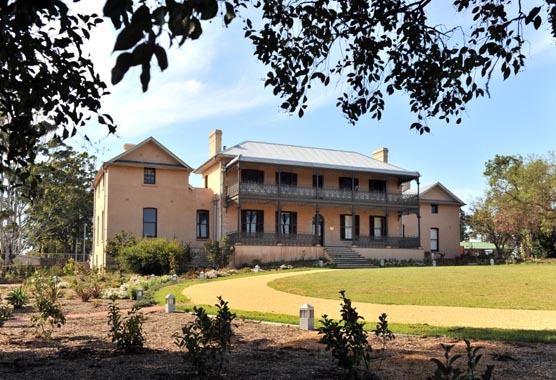 The Eastwood Patchwork Quilters exhibition venue is Brush Farm House at Eastwood, once home to Gregory Blaxland the explorer. Coincidentally, the week after our exhibition is the 200th anniversary of Blaxland, Wentworth and Lawson departing on their expedition that eventuated in the first European crossing of the Blue Mountains…………….what a great event to work with our beautiful quilts. Eastwood Patchwork Quilters has nearly 100 members, our group has been operating continuously for over 25 years and we are proud to still have some original members. This is our 13th biennial exhibition and our 2011 event was a huge success with 140 quilts on display, plus displays of baby quilts and bags. With our raffle and donations we were able to donate $8000 to Achieve Australia. This year Eastwood Patchwork Quilters is supporting the Special Olympics – an organisation that inspires people with intellectual disability to reach their personal best through regular sport and competition. This entry was posted in Brush Farm, charity, Eastwood, Eastwood Patchwork Quilters, epq, exhibition, patchwork, quilting, quilts and tagged Brush Farm, Eastwood, Eastwood Patchwork Quilters, EPQ, exhibition, patchwork, patchwork exhibition, quilt exhibition, quilting, quilting group, quilts, raffle, Special Olympics by eastwoodpatchworkquilters. Bookmark the permalink.